Swedish regional aircraft lessor Rockton has signed a letter of intent (LOI) for an order of ten Mitsubishi Regional Jet (MRJ) 90 aircraft. The LOI includes options on a further ten airframes. Rockton and Mitsubishi Aircraft Corporation will now work together to finalise the deal with first deliveries due to begin in 2020. 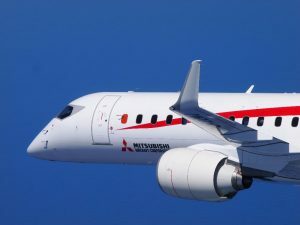 A total of 407 MRJ aircraft have been ordered so far with a further 40 to be added to the orderbook once Mitsubishi Aircraft has signed definitive agreements with Rockton and fellow lessor Aerolease Aviation. That figure consists of 243 firm orders, 180 options and 24 purchase rights. Six months after the prototype Mitsubishi Regional Jet (MRJ) first flew on November 11, the second flight test (FTA-2) aircraft has taken to the sky. On May 31, JA22MJ (c/n 10002), took off from Nagoya Airport and headed to airspace off the Pacific coast where the aircraft’s basic flying characteristics and functionality were confirmed. Later this year Mitsubishi Aircraft is due to establish its main flight testing base at Grant County International Airport at Moses Lake in Washington State where the majority of the type’s certification work will be carried out. The MRJ-90 is expected to receive its regulatory approvals by early 2018, with first deliveries slated for mid-year.